I first discovered Ramsey Campbell in 1989 when I selected his novel ANCIENT IMAGES from the horror section of our local Borders Book Shop. I was instantly hooked, and it set me off in search of more. MIDNIGHT SUN, INCARNATE, NAZARETH HILL, THE DARKEST PART OF THE WOODS, and THE GRIN OF THE DARK were a few of the fantastic novels that followed afterward. A also fell in love with his amazing short pieces, so much so that I now consider his collection ALONE WITH THE HORRORS my all time favorite horror book. His ability to consistently craft masterful tales of horror and unease is awe-inspiring and ignited my desire to write my own tales of terror. He is, without question, my favorite writer, so I was tremendously honored he agreed to this interview. 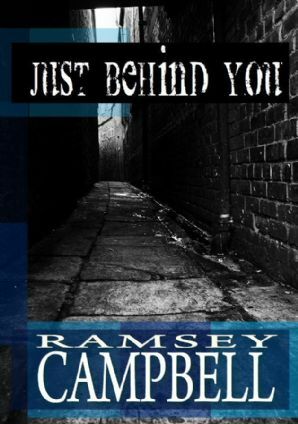 How do you sum up Ramsey Campbell’s amazing career? He’s written hundreds of short stories, well over thirty novels, edited numerous anthologies, and has won more awards than any writer in the field, including British Fantasy Awards, World Fantasy Awards, The Stoker Award, The Grand Master Award of The World Horror Convention, The Horror Writer’s Association’s Lifetime Achievement Award, and The Living Legend Award of The International Horror Guild. 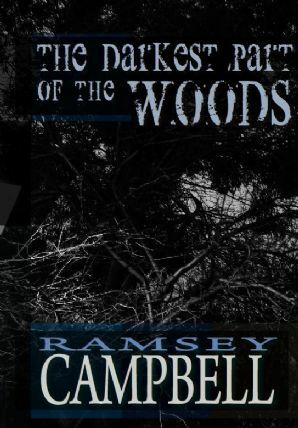 In short, Ramsey Campbell is an icon of the genre. 1. I read that seeing the cover of a Weird Tales magazine on a newsstand when you were young sparked your interest in the horror genre. Have you tracked down that issue, and if so, did it live up to your early impressions of it? I believe I was seven by then. In those days it was common for general stores to sell books and magazines, and one day in Southport (a seaside report near Liverpool) I saw the magazine that may have started my career, in a sense (though I was already reading adult tales of terror borrowed from the public library on my mother’s tickets). The cover appeared to depict a bird-like creature cowering in terror of two monstrosities—huge human skulls for heads and very little in the way of bodies – approaching it across a black desert. If the cover looked like that, what extraordinary things would the magazine contain? At seven I wasn’t allowed to find out, and so the image and the name of the publication – Weird Tales – haunted me for years. A decade later I identified the issue for November 1952. The cover shows a vulture perched on some bones with two admittedly evil-looking human skeletons in the background. It seems to me that back in 1953 my mind was already bent on improving on the terrors I encountered and rendering them even more grotesque. 2. Two of your novels, ANCIENT IMAGES and THE GRIN OF THE DARK, involve the search for suppressed movies. Are there any real life films that served as your inspiration? Not for those books, except in a general sense – the British censorship history of horror films underlay Ancient Images, and the film in The Grin of the Dark was originally about a lost silent serial of the kind made by Feuillade and Fritz Lang (it even had a title, The Sixth Face of the Spider) until the notion of a silent comedian took over. Pretty often my tales, especially the novels, change radically in the process of writing. The Kind Folk started life as The Black Pilgrimage, but moved so far away from the original concept that I plan to write that under the original title in due course. On films, though – I recently realised that “The Companion” derived to an extent from Carnival of Souls, and I always aware that the scene in Incarnate in which a character sprouts a second head derives from The Manster, in which the sight seems horribly comic or comically horrible. Luis Buñuel’s Los Olvidados was an important early influence on my stuff from Demons by Daylight onwards. Filmed in 1950, it’s as shocking as the director’s work with Salvador Dali, but the surrealism is inseparable from Buñuel’s unflinching view of life in the slums of Mexico City. It contains a nightmare that throws an extra light on the realism, while some of the realistic images are so grotesque as to border on the surreal. I think the film’s interaction of social observation and the fantastic may have shown me how I could develop as a writer; certainly that’s the route I took. 3. In “Among the Pictures Are These” you describe some drawings you did in the 70’s. Do you still do any sketches these days, and if so, do you ever share them? 4. I discovered some of my favorite writers after you listed them as influences on your writing, M.R. James and Algernon Blackwood to name a few. Can you suggest some classic horror stories or writers you feel have fallen unjustly into obscurity? Not sure how obscure they are, but a few folks might look out for if they don’t know them. 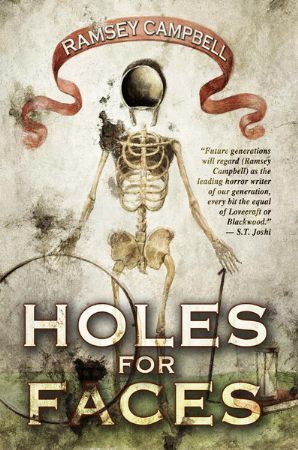 Adrian Ross’s The Hole of the Pit is an atmospheric novel dedicated to M. R. James and somewhat reminiscent of Hope Hodgson. Thomas Hinde was one of the earliest exponents of comedy of paranoia – The Day the Call Came was a considerable influence on my move in that direction (in tales like “The Lost”). As for classics that surely aren’t obscure, I do feel Le Fanu is a bit neglected these days, though he refined the gothic as Poe did, in his own way, pretty well inventing the supernatural tale that’s inextricably bound up with the psychology of the protagonist. Equally, surely Fritz Leiber isn’t obscure, but he may be said to have invented the modern urban supernatural tale in “Smoke Ghost”, in which instead of being invaded by the supernatural, the mundane setting – forties Chicago – is now its source, and the grubby half-glimpsed spectre its genius loci. Grab all of his tales that you can find – you should be glad you did. A couple of offbeat anthologies that folk might want to rediscover are Whit and Hallie Burnett’s 19 Tales of Terror and Don Congdon’s Stories for the Dead of Night. And how about John Collier? Fancies and Goodnights is a treasure trove of fantasy and the macabre that really does deserve revival. 5. Of your own work, short stories, novels or both, do you have a particular favorite? I’m still pretty fond of Needing Ghosts as my first extended essay in comedy of paranoia. For somewhat the same reason I do like The Grin of the Dark as a longer one. Of my bids to be cosmic, I think The Darkest Part of the Woods has some good scenes, and maybe The Kind Folk gets the mythic to an extent. Short stories – well, I think “Again” works well as pure horror, while “Just Behind You” and “Peep” have a bit more substance. Fearful Implications, forthcoming from Centipede Press, will try to collect my best short work, even shaky stuff like “The Companion”. 6. Who are some modern horror writers you would recommend to your fans? Lord, I’m afraid of omitting some, and I fear I will… But a few are Lynda Rucker, Mark Samuels, Thana Niveau, John Llewellyn Probert, Simon Bestwick, Cate Gardner, Timothy Jarvis, Alison Littlewood, Gary McMahon, Reggie Oliver, Joe Hill, Andrew Hurley… And a writer we had on the James Herbert Award shortlist, though her work is marketed as young adult fantasy – the highly talented Frances Hardinge. 7. What processes do you go through when beginning a new story or novel? I haven’t plotted in advance for many years (the last novel where I tried that to see what the result might be, Pact of the Fathers, was disastrously badly constructed and benefited from a great deal of editorial advice from Melissa Singer). Instead I gather material in my notebooks until the tale feels impatient to be written – by then I’ve tried to establish crucial details such as the names and occupations and relationships of the characters, not to mention settings and such – and then I set forth on the first draft. 8. Are there any environmental settings you like in place when preparing to write a particularly terrifying or eerie scene? My writing environment, do you mean? It’s all in my head. For instance, I wrote a scene of subterranean horror in the first draft of my latest novel (The Searching Dead) on a sunlit balcony in Rhodes looking out on the sea. 9. You’ve had such an amazing career. Could you share some advice for new writers? You may be sorry you asked… I’m not the first to say that the most important thing for a writer to do is to write, but I’ll add that you should work on whatever you’re writing every day until it’s finished; to do otherwise is to court writer’s block, every blank day adding to the hurdle that prevents you from getting back into the story and making the task seem more impossible. An example of this is my story “Litter”, where six months elapsed between my first day’s work and my return to the story, which I took up by writing the line “That’s how he enters the story, or this is.” I should have rewritten the story to improve its shape, of course. Now I rewrite more and more severely, and take great pleasure in cutting thousands of words out of first drafts; I think that’s a pleasure worth learning as early as possible in one’s career, not least because realizing one can do it helps one relax into writing the first draft, where it’s better to have too much material for later shaping than not enough. Learning to relax enough with the technique of writing novels comes easier to some than others; you may feel you need to plot a novel in advance (maybe all the way to breaking it down into chapter synopses) before you begin the first chapter, but it’s worth trying to regard the synopsis merely as a safety net once you begin writing, trying to let the novel develop itself as it takes on more life. I did that first in Incarnate, and since then I’ve avoided plotting or constructing too far ahead, trying to know only as much as I need to know to start writing and head in the right direction. It can be fearsome to find yourself losing your way halfway through a novel, all by yourself in the unknown, but I find that the solutions are usually somewhere in what you’ve already written, and I can tell you that the bad days are worth the days when you feel the novel come to life. 10. I know you’re a film reviewer and connoisseur. Have there been any recent horror movies that have impressed you? It Follows has a real sense of spectral dread, I think. Two films in the documentary style – The Borderlands (with an unexpectedly Lovecraftian coda) and The Casebook of Eddie Brewer both unnerved me with their suggestiveness, as did Across the River. Watch films – my day ends about four in the afternoon, having begun at six in the morning, and then the Blu-ray player comes into play. Music too (usually classical), often with one of my wife Jenny’s great dinners. 12. 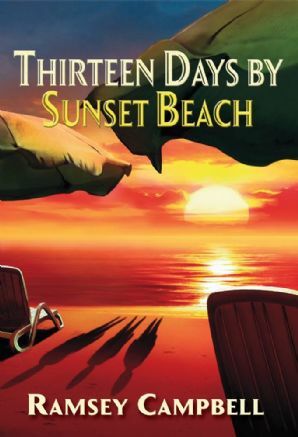 Your novel, 13 DAYS AT SUNSET BEACH, has been recently released by PS Publishing. Can you tell us a about it? 13. Can you talk about any current projects you are you working on? It’s a trilogy of my Brichester Mythos – The Three Births of Daoloth – of which the first novel is indeed The Searching Dead. Thank you for the great interview, Ramsey! This has been an incredible honor. Great interview. Ramsey was my introduction to horror as serious literature. Still think “The Nameless” is one of the scariest things I’ve ever read. Ramsey is phenomenal. He’s absolutely my favorite writer ever. Did you know THE NAMELESS was made into a feature film? Very nice, Matt! Great questions and Ramsey answered them all with thought and substance. I was particularly interested in his writing process. His comments about playing music were interesting, as I find it distracting when I’m writing. Thanks, Barry! I also like to listen to music when I write. It helps set the mood for me. I tend toward the haunting, somber sounding melodies.